I’m no longer working on this comic, just keeping it here for posterity’s sake. Aaaaahhh!! Unholy magics are afoot! This gryphon is possessed! This bird is FOUL! 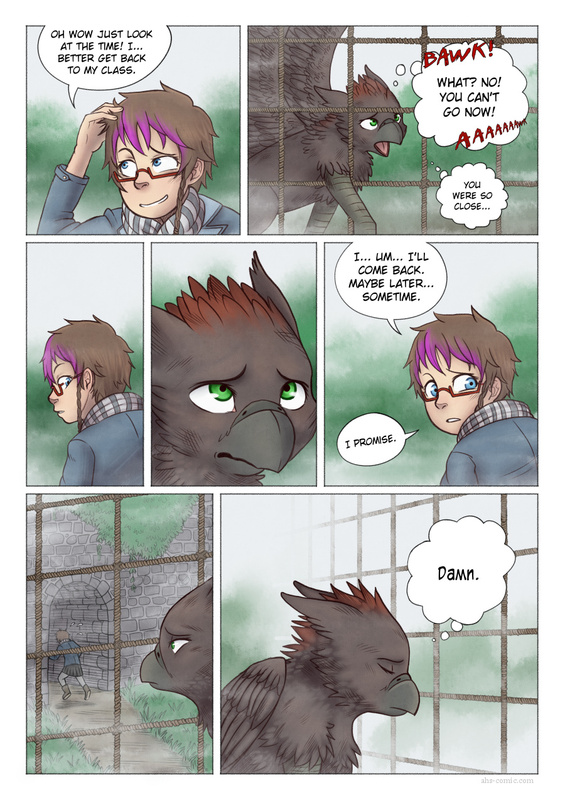 And so the story of Lisa the sad gryphon continues. Now I feel sad…for the bird (?) AND your wrist, I really hope it gets better quick. It seems to be quite common with cartoonists. Not really a surprise of course. Best of luck and quick recovery! I tend to have a bit of trouble with that myself. I get it from the mouse. I use a wrist brace, and that’s usually enough. If it flares up, though, I’ve found it VERY helpful to rub ice on the inside of my wrist for a minute or two. I make the ice in a Dixie cup and peel back the edge to expose the ice. There’s an almost immediate short term, helpful effect, plus if I keep doing it on a regular basis, even when it’s not bothering me, I get long term improvement. Then I get lazy and the cycle starts again. I don’t know if that’s enough for you but I’m reasonably certain it would help. Several times a day is not too often; once a day is enough to have a long term effect. BTW, I like what you’re doing with the color.